Pete is a grumpy young pumpkin who decides to leave the pumpkin patch to avoid children and Halloween. Pete rejects his purpose, his friends, and old Farmer Dale and wanders off, only to end up alone and afraid in a dark and scary place. However, just like God came looking for us in our wanderings, Farmer Dale finds, forgives, and restores Pete. 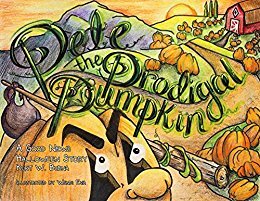 Pete the Prodigal Pumpkin: A Good News Halloween Story is a powerful and touching tale of love and redemption that reminds every child how our Father God loves us beyond measure. This full-color, fully illustrated book is top bound (calendar style) for easy lap reading to children. It also has two coloring pages at the end!